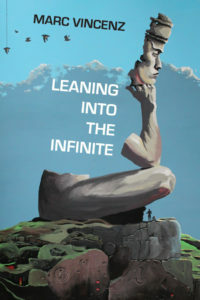 One of the first things that came to mind while reading Marc Vincenz’s new poetry collection, Leaning into the Infinite, was a class called Philosophy of Space and Time I took in college. Space and time can be trippy on their own, so together — what a mind-boggling experience. We covered philosophical ideas, such as Zeno’s paradox, which attempts to address the relationship between small or big space, time, and motion, the infinite or finite. We studied the proof that motion is an illusion, the object that never moves in relation to its space. How one never moves forward because of the infinitely finite number of small-half points. The idea of perspective, also addressed in Leaning into the Infinite. There is a clear line between reality and fantasy. Science and mythology, however, allow for the exploration of both intellect and imagination. Vincenz explores the nature of our world — from the atomic to the human, up astronomical scales, covering language, literature, myth, and history. He incorporates it all into his poetry, with the vocabulary of chemistry, ecology, and anthropology — all with a twist of figurative verbal stylistics. Despite the fact that this poem can be interpreted in many ways (as any poem), what distinguishes Vincenz is his handiness for craft. He retreats from obvious thoughts while still broadening the idiosyncrasies of life. Frank in wit, yet cryptic in aim. This particular poem is made up of simple words, yet their significance is weighty. The first two stanzas aren’t about coffee the way we know it, but about how matter is made up of small indivisible and indestructible objects called atoms. Philosophers like Leucippus and Democritus hypothesized that atoms come in a variety of shapes and sizes and, once combined, are formed into the different ways we perceive them. Democritus went further, stating that atoms are in constant motion and constantly colliding. But the argument is that in order for atoms to move, empty space, or “the void,” must exist. Vincenz drifts through space and time to expose the possibilities this world holds in plain sight. The fourth and fifth stanzas explain how the spontaneity of discovery can be anywhere — the way Einstein’s theory of relativity might be on a book of matches. He brings out the mundane supernatural phenomenon that drives the universe, but ends with “How nothing / is the sound / of itself.” Perception, leading to nothing being how it really appears. Vincenz’s fascination with the mysteries of philosophy and language is everywhere in these poems. The collection encourages contemplation of whether the lines are literal or metaphorical; what barriers and boundaries separate those with free will and those without. The volume is artfully split into two sections: “Something Stereophonic Unsettles the Breeze” and “Unspeakable Desire.” Each section has multiple parts that tell stories of myths and legends, how the world came to be, and how the universe works. However, Vincenz takes the storytelling further, inventing poetic dialogues between otherworldly beings whose emotions are a reflective coupling of our own: “x. Still, in the knot of perspective, / a voiceover says: / All roads are travelled. / Vibration determines everything.” Vincenz’s expansive paper canvas is settled with words that paint a link between the subconscious and unconscious, and the expanding universe — that expands only as far as the reader is willing to keep looking. Vincenz teaches that perception is unique and beautiful. “Reality must exist, surely, even / if nature itself depends on its perceptions.” The laws of the universe are not simply just governed by mathematical equations, but also by one’s own creativity. And since the advent of man, it has been storytelling that advanced the species, evidenced in quotes from eminent figures in mathematics, philosophy, poetry, literature, and art. The mysticism that Vincenz introduces is one that combines modern day sciences with ancient religions. “As Plato points / towards heaven / Aristotle points / toward the dirt. / & as God touches the finger of Adam, / so Adam touches the hand of another—.” He delves into the relationship between the Creator (God) and the creation (humans, space, creatures), speculating about how a conversation between the two might be carried out. At the end of almost every poem, questions of core beliefs, culture, and societal values that may or may not have been unconsciously imposed begin to arise. The realms that Vincenz creates leave the reader just as the cover art of the book portrays, a man made of stone, thinking, his mind in a state of cognitive plasticity. From the flow of nature to the elegance of his words and form, the book fosters space for readers to fearlessly dip into the unknown, and question one’s state of being while recognizing that we are human-becomings just as much as we are human-beings, and that to live is to lean into the infinite. Aminah Abutayeb is a Professor at William Paterson University. She recently graduated from Fairleigh Dickinson University where she obtained her MFA in Poetry. She is a poetry reader at The Literary Review. Her work has appeared in Philadelphia Stories and Common Ground Review.